Wiebe, Heather 2015. Discovering America: From Paul Bunyan to Peter Grimes. Cambridge Opera Journal, Vol. 27, Issue. 02, p. 129. “American Ballet at Westport.” 1936. Musical America, August. “American Ballet Group Completes New England Tour.” 1936. Musical America, September. Badger, Anthony. 1989. The New Deal: The Depression Years, 1933–1940. New York: Hill and Wang. “Ballet Caravan Forms to Give Performances.” 1936. New York Herald-Tribune, July 5. “Ballet: Caravan.” 1936. Dance, December. “Ballet Closes Tour, Will Fill Week's Engagement in Ogunquit, Me.” 1936. New York Herald-Tribune, August 30. “Ballet Makes Debut.” 1936. Musical America, November 10. “Ballet Numbers at Westport.” 1936. New York Herald-Tribune, August 2. “Ballets Are Brilliantly Performed.” 1936. Hartford Courant, December 2. Banes, Sally. 1999. “Sibling Rivalry.” In Dance for a City: Fifty Years of the New York City Ballet, edited by Lynn, Garafola with Eric, Foner73–98. New York: Columbia University Press. Boris, Ruthanna. 1937. “The Ballet Caravan.” Dance Herald 1(1). “Brothers to Honor Maureen V. Smith at Dance Friday.” 1936. New York Herald-Tribune, July 30. Campbell, Jennifer L. 2010. “Shaping Solidarity: Music, Diplomacy, and Inter-American Relations, 1936–1946.” PhD diss., University of Connecticut. Chujoy, Anatole. 1953. The New York City Ballet. New York: Knopf. Church, Marjorie. 1936. “The Bennington Dance Festival.” Dance Observer 3(7). Crist, Elizabeth Bergman. 2005. Music for the Common Man: Aaron Copland During the Depression and War. New York: Oxford University Press. “Current Happenings on College Campuses.” 1936. The New York Times, October 11. “Dance Notes.” 1936. New York Herald-Tribune, July 12. Denby, Edwin. 1936. “With the Dancers.” Modern Music (November–December): 49–53. Denning, Michael. 1997–2010. The Cultural Front: The Laboring of American Culture in the Twentieth Century. New York: Verso. Doss, Erika. 1995. Benton, Pollock, and the Politics of Modernism: From Regionalism to Abstract Expressionism. Chicago: University of Chicago Press. Duberman, Martin. 2008. The Worlds of Lincoln Kirstein. Evanston, IL: Northwestern University Press. “East Hampton Planning Benefit Fashion Show.” 1936. New York Herald-Tribune, August 7. Franko, Mark. 1995. Dancing Modernism/Performing Politics. Bloomington, IN: Indiana University Press. Franko, Mark. 2002. The Work of Dance: Labor, Movement and Identity in the 1930s. Middletown, CT: Wesleyan University Press. Franko, Mark. 2012. Martha Graham in Love and War. New York: Oxford University Press. Garafola, Lynn. 1999. “Dance for a City.” In Dance for a City: Fifty Years of the New York City Ballet, edited by Lynn, Garafola with Eric, Foner1–51. New York: Columbia University Press. Garafola, Lynn. 2005a. Legacies of Twentieth Century Dance. Middletown, CT: Wesleyan University Press. Garafola, Lynn. 2005b. “Lincoln Kirstein, Modern Dance, and the Left: The Genesis of an American Ballet.” Dance Research 23(1): 18–35. Garafola, Lynn. 2005c. “Making an American Dance: Billy the Kid, Rodeo, and Appalachian Spring.” In Aaron Copland and His World, edited by Carol, Oja and Judith, Tick, 121–47. Princeton, NJ: Princeton University Press. Graff, Ellen. 1997. Stepping Left: Dance and Politics in New York City, 1928–1942. Durham, NC: Duke University Press. “Guild Hall Dinner at East Hampton.” 1936. The New York Times, August 9. Kirstein, Lincoln. 1930. “The Diaghilev Period.” Hound & Horn 3(4): 468–501. Kirstein, Lincoln. 1931. “Dance Chronicle: Kreutzberg; Wigman; Pas d'Acier; The Future.” Hound & Horn 4(4): 573–580. Kirstein, Lincoln. 1938a. Blast at Ballet: A Corrective for the American Audience. New York: Marstin Press. Kirstein, Lincoln. 1978. Thirty Years: The New York City Ballet. New York: Knopf. Kirstein, Lincoln. 1983. Ballet: Bias and Belief: Three Pamphlets Collected and Other Dance Writings of Lincoln Kirstein, edited by Nancy, Reynolds. New York: Dance Horizons. Kriegsman, Sali Ann. 1981. Modern Dance in America: The Bennington Years. Boston: G. K. Hall. Levy, Beth. 2012. Frontier Figures: American Music and the Mythology of the American West. Berkeley, CA: University of California Press. Lloyd, Margaret. 1936a. 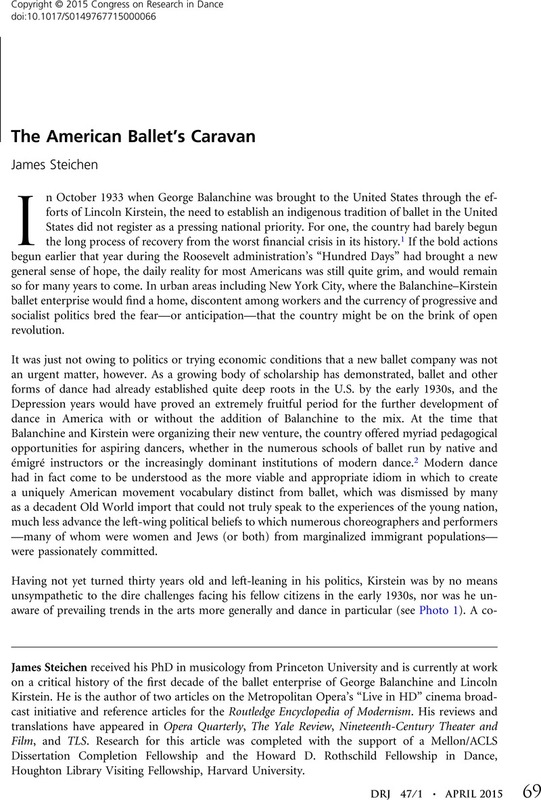 “Ballet Caravan—Farewell, Hail.” Christian Science Monitor, November 10. Lloyd, Margaret. 1936b. “On with the Dance: Bennington the Focus of This New Movement.” Christian Science Monitor, November 10. “Manchester Plans Ballet Caravan for Summer Visitors.” 1936. New York Herald-Tribune, August 9. Manning, Susan. 1993. Ecstasy and the Demon: Feminism and Nationalism in the Dances of Mary Wigman. Berkeley, CA: University of California Press. Martin, John. 1936a. “The Dance: A New Troupe.” The New York Times, June 28. Martin, John. 1936b. “The Dance: Importations.” The New York Times, July 5. Martin, John. 1936c. “The Dance: New Literacy.” The New York Times, August 2. Martin, John. 1936d. “The Dance: Festival.” The New York Times, August 9. Martin, John. 1936e. “The Dance: A Pantomime.” The New York Times, August 30. Martin, John. 1936f. “The Dance: Miscellany.” The New York Times, September 6. Martin, John. 1936g. “Odyssey of the Dance.” The New York Times, September 13. Martin, John. 1936h. “The Dance: Jooss Ballet Appearance.” The New York Times, October 11. Martin, John. 1936i. “The Dance: Events Ahead.” The New York Times, October 18. “Maureen V. Smith Is Guest at Dinner.” 1936. The New York Times, August 1. Morris, Gay. 2006. A Game for Dancers: Performing Modernism in the Postwar Years. Middletown, CT: Wesleyan University Press. “Music Notes.” 1936. New York Herald-Tribune, October 13. “Nancy Van Vleck Honored At Party.” 1936. The New York Times, July 28. “Notes of Social Activities in New York and Elsewhere.” 1936. The New York Times, August 7. Parks, Wallace J. 1936. “A New Center of the Dance.” Baltimore Sun, September 13. Reynolds, Nancy. 1977. Repertory in Review: Forty Years of the New York City Ballet. New York: Dial Press. Reynolds, Nancy. 1999. “In His Image.” In The Ballets Russes and Its World, edited by Lynn, Garafola and Nancy, VanNorman, Baer, 291–311. New Haven, CT: Yale University Press. Rhodes, Russell. 1936a. “New York Letter.” The Dancing Times, August. Rhodes, Russell. 1936b. “New York Letter.” The Dancing Times, September. Soares, Janet Mansfield. 1992. Louis Horst: Musician in a Dancer's World. Durham, NC: Duke University Press. Soares, Janet Mansfield. 2009. Martha Hill and the Making of American Dance. Middletown, CT: Wesleyan University Press. Sowell, Debra Hickenlooper. 1998. The Christensen Brothers: An American Dance Epic. Amsterdam: Harwood Academic Publishers. “Studio Party Held At East Hampton.” 1936. The New York Times, July 26. “Summer Theatres.” 1936a. Boston Globe, August 23. “Summer Theatres.” 1936b. Boston Globe, August 30. “Summer Theatres: Ogunquit Playhouse.” 1936. Boston Globe, September 1. “T. H. Wrights Hosts At Southampton.” 1936. The New York Times, July 30. “Twenty-One New Singers Are Announced by Metropolitan.” 1936. New York Herald-Tribune, November 16. Zeller, Jessica. 2011. “Shapes of American Ballet: Classical Traditions, Teachers, and Training in New York City, 1909–1934.” PhD diss., The Ohio State University.